This would have to be my favourite roast marinade, for beef or lamb. Rosemary and juniper berries are the star ingredients, and though usually thought to be a good accompaniment to lamb, they work just as well with beef. Juniper berries are available from the spice section of the supermarket and I love them. Gin and tonic being my favourite drink might have something to do with that. Juniper berries are what is used to give gin its beautiful spicy, citrus flavour. They can be tough little buggers to break but of course the Thermomix makes light work of that. If you have time make this marinade in advance, coat your meat and let it sit in the fridge for up to a day. If you don’t that is fine too. I’m usually not that well prepared! Combine juniper berries, rosemary leaves, garlic and salt in to the TM bowl and grind until fine on Speed 10 (use your ears to tell when its done. Using a spatula, (silicon if possible) scrape all of the blend out into a bowl. Add mustard and oil, using you judgement to get a nice consistency. 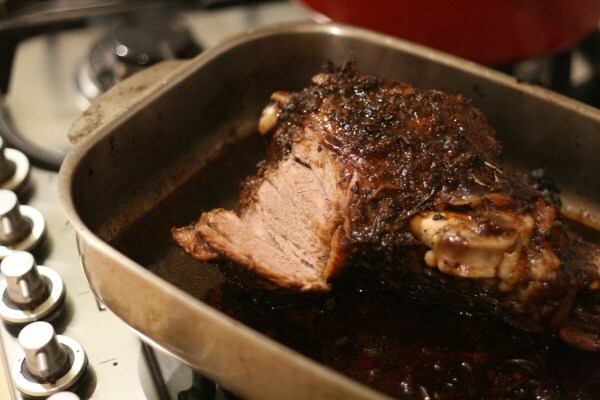 Coat your cut of meat and place in roasting pan. Either refrigerate until ready to cook or place in the oven. When placing in the oven gently pour over 200mls of red wine, cover with foil and roast as per usual. A beautiful marinade for grilled steaks. When I was roasting this leg of lamb I put the lamb on for about 5-6 hours. Initially I heated the oven to 200′ and seared the meat in there for 20 minutes. Then I reduced the temperature to 150′ and let it have a long slow roast, I added a cup of water about half way through and basted the leg. Thirty minutes before removing I took the foil from the top, basted again and let it brown. It was my best roast ever. That looks delish! Ill be trying that next time we cook up a roast – thanks! It's look impressive, great thanks for sharing. We also have a great details for more information please visit at Thermomix Today.